His elite fleece is consistent front to back and his numbers show it. Check him out and think about how he can "Emboss" your herd. If you are looking for a herdsire to pass on uniformity, improve conformation, tremendous staple, and full coverage - this is your boy. "The Boss Man's" fleece is just gorgeous with a wonderful handle. We expect he would improve white or color with his background. His Herdsire and Dam have both proven they pass on excellent genetics by winning Get of Sire and Produce of Dam. Embosser is now actively breeding with cria now on the ground! Temple, Chantilly Lace, Giada (Champion), Carmen (Reserve Champion)...White or fawn, all simply stunning!! Ask about Embosser's Banner & ribbon winning offspring! Embosser is now proving himself winning his first Get of Sire! Felix and Accoyo Express blended their genes in this perfect recipe. 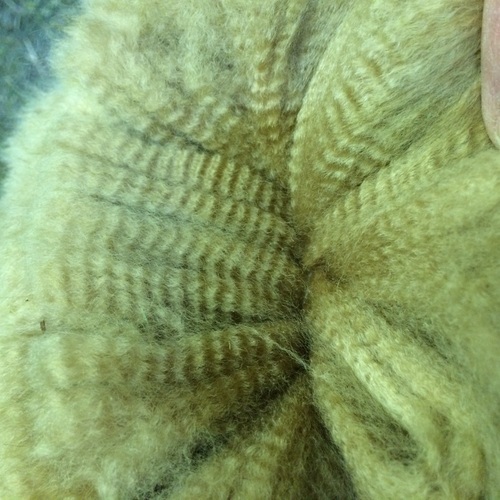 Saffron's fleece is bright, beautiful, full of character and dense. We chose to breed Saffron to our own TWF Peruvian Embosser after his first cria, Temple, arrived. Expecting excellence in color! And oh what a breeding it was! Giada is simply stunning!! With 2 blue ribbon daughters it was a no brainer to breed Saffron back to Embosser for 2014...the result is Sarafina! 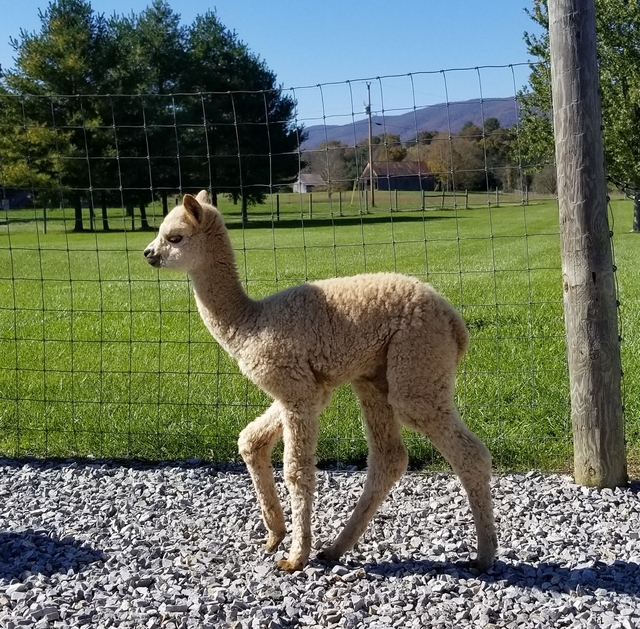 Sarafina's 2018 cria arrived on 10/13/18, and wow!...density and character is AMAZING! Medium fawn female out of 2017 AOA National Supreme Champion, Man in the Moon's Peruvian Ganymede. This combination of GANYMEDE and TWF Sarafina definitely works! 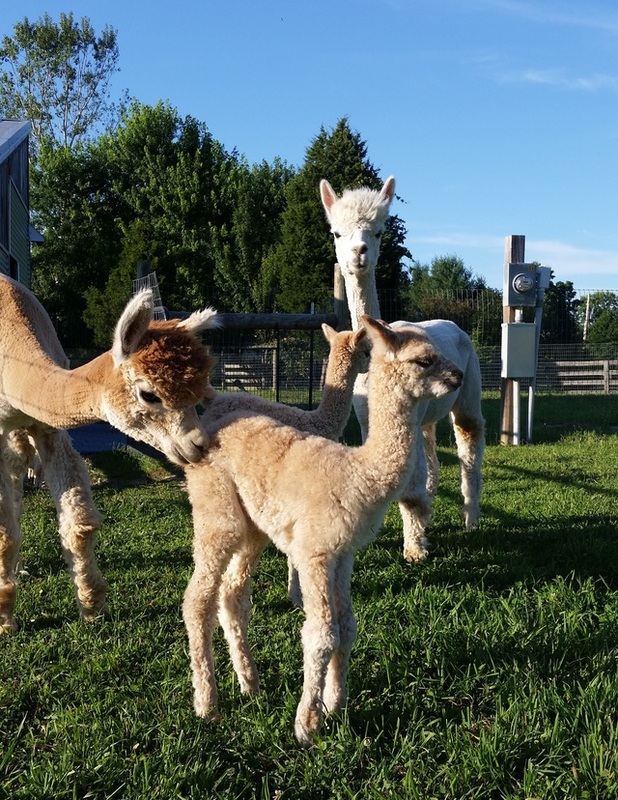 We kind of knew it would since Sarafina's 2017 cria out of Ganymede's sire was astounding, too. Sarafina is just perfect, and she's been bred back to Ganymede -- Her current cria, Elara, will not be sold with Sarafina, and if Sarafina is sold, she will remain at MMFA until Elara is weaned. If you are breeding for fiber that has amazing uniformity, consistency, lasting fineness, and is "the SAME all over! ", this is an incredible place to start. 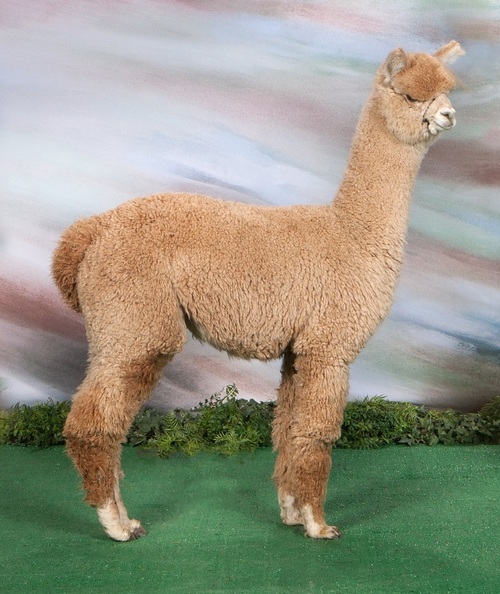 Sarafina's fleece, and the unmatched consistency of Ganymede, has produced an amazing pair. UPDATE: Her Fall 2018 cria arrived on 10/13 -- and it's a beautiful medium fawn female! That makes 100% female production for Ganymede in 2018! Sarafina has a uniform consistent crimp, a very soft handle, great staple length, very good density, and fineness across the staple. She had a textbook perfect birth, and displays excellent mothering instincts. Her size and conformation is just perfect for production, too. She's just a beautiful girl...Her genetics are also impressive. 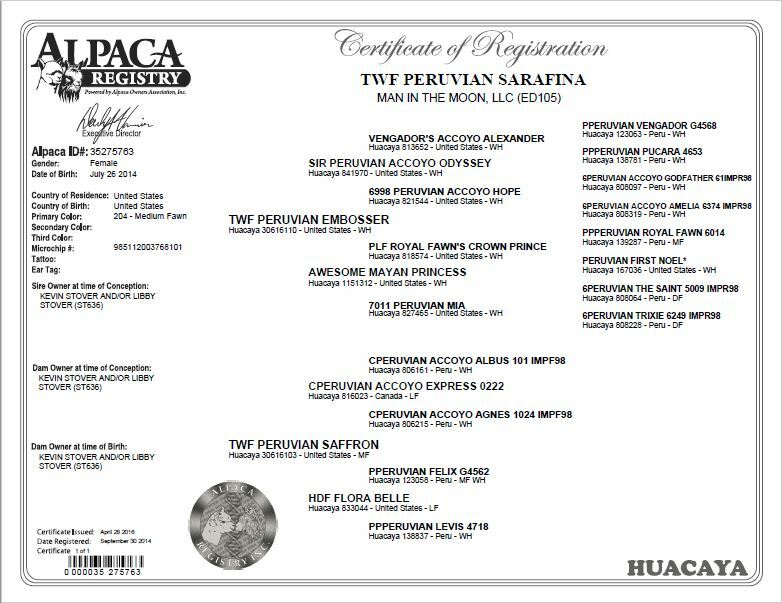 Sarafina's sire, TWF Peruvian Embosser (Odyssey, Godfather, Vengador, Royal Fawn) passed on his elite fleece, handle, staple and coverage. Her dam, TWF Peruvian Saffron (Felix, Accoyo Express) also passed on her dense, bright fleece. 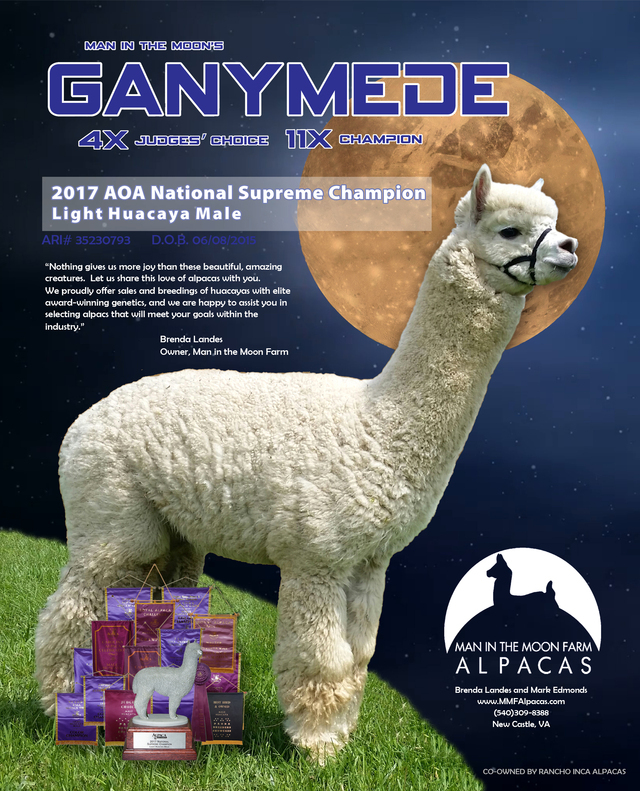 Her service sire, Man in the Moon's Peruvian Ganymede, is an 11X Color Champ and 4X Judge's Choice winner in white, with amazing fleece and excellent conformation. The Judges have said: "He's the SAME...All Over!" See his web page for more info. He is SPECTACULAR! Note: Special pricing available for multiple alpaca purchases. Standard industry contracts are used. 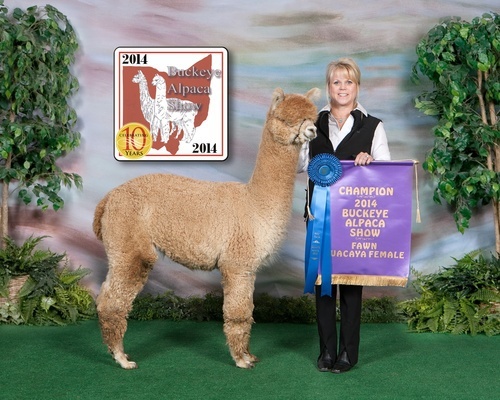 Breeding quality alpacas come with reproductive and live birth guarantees & 90 day free board. You may take possession of your alpacas once the down payment is received and the “contract for purchase” signed by both parties. Transfer of ownership with ARI will not occur until full payment is received. Financing is available with 25 - 33% down, with up to 24 monthly payments, to qualified buyers. 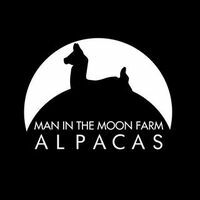 Buyer must purchase full mortality insurance for alpaca and offspring, if any, naming Man in the Moon Farm LLC as beneficiary on balance due until paid in full. For individual purchases over $3000, significant discount for cash sales paid in 30 days. Special pricing often available for multiple alpaca purchases. Transportation responsibility of buyer. AUCTION & PACKAGED DEAL OFFERS: These are cash only unless different arrangements are made up front. No other discounts apply unless negotiated otherwise. Gorgeous Fawn Female out of GANYMEDE!